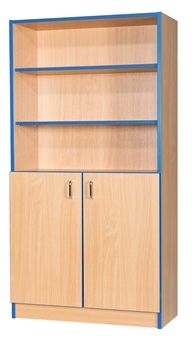 High Quality Flat Top Cupboard for the school library, or office. 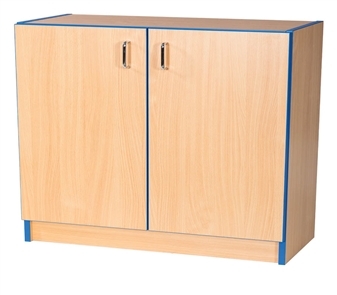 This professional quality wooden storage unit is also ideal for the school classroom, or other storage areas in the school. The bookcase shelves are adjustable and the unit comes in a choice of plain beech, or red, blue, yellow, plum or green laminate edging and doors. Available in 3ft, 4ft, 5ft, or 6ft heights. The units will fit alongside other bookcase units in this same range. The unit comes fully assembed and is manufactured in a scratch resistant, wipe clean laminate. Optional locks available for the cupboard doors.